OVER FORTY-THREE MILLION PASSENGERS are carried yearly on the 3,700 miles of track in the Central Argentine Railway’s system. Above is the “Panamericano” International Express leaving the Retiro Terminus at Buenos Aires. The chief expresses on the railway are hauled by P.S.11 type engines, and are frequently formed of fifteen coaches, representing a gross weight of 650 tons. THE great Republic of Argentina is served by over 23,000 miles of railways, and many of its lines have been built by British companies which have spent hundreds of millions of pounds on them. Argentina is situated in the south of South America, being bounded on the north by Bolivia and Paraguay, on the north-east by Brazil and Uruguay, on the east by the South Atlantic Ocean, and on the west by Chile. The area is 1,112,700 square miles, and the estimated population in 1933 was over 12,000,000. The language is Spanish, and the normal gauge of the railways is the Spanish one of 5 ft 6-in, although standard and narrow gauges are found as well. Buenos Aires, the capital, has over 2,200,000 inhabitants, and is the largest city in the southern hemisphere and one of the largest in the world. It is a great port, situated on the wide Rio de la Plata (River Plate), and is the gate through which most people and goods pass into and out of the country. The city is the centre of a network of railways that are the most important in South America. The railways have helped considerably to develop Argentina and Buenos Aires. The termini of three British-owned railways, the Central Argentine, the Buenos Aires and Pacific, and the Cordoba Central, are together at Retiro, Buenos Aires, the companies having had to provide the land for their lines and stations by reclaiming it from the River Plate. The Central Argentine system represents the fusion since 1870 of a number of lines, the last and most important amal-gamation being that with the Buenos Aires and Rosario Railway in 1902. The first section of the Central Argentine Railway, from Rosario to Cordoba, was begun in 1863, and completed in 1870. Since then numerous extensions and amalgamations have brought the total length of the system to about 3,700 miles of 5 ft 6-in gauge. The last extension was added in August, 1932, with the opening of a branch 325 miles long, from Villa del Rosario, in the province of Cordoba, to Forres, in the province of Santiago del Estero, running through a region of great natural fertility and offering considerable industrial possibilities. The main trunk line runs northward for over 700 miles through the provinces of Buenos Aires, Santa Fe, Santiago del Estero and Tucuman. The fertile and picturesque province of Cordoba, in the west, is traversed by a number of branches running more or less parallel and converging on the cities of Cordoba and Rio Cuarto. The railway thus traverses five provinces, and runs through the heart of the grain belt, from which the bulk of the company’s traffic and revenue is derived. Outside Buenos Aires the railway serves the principal cities in the central and northern zones of the Republic, including Rosario, Santa Fe, Cordoba, Santiago del Estero, Tucuman, and Rio Cuarto, in addition to the river ports of San Nicolas, Villa Constitucion, Zarate, San Pedro and Baradero, all of which are situated within the Central Argentine zone of influence. Rosario, with 500,000 inhabitants, is the second city in Argentina in population and commercial importance. Next to Montreal it is the largest grain-shipping port in the world. As wheat, maize, and linseed are extensively cultivated in almost all parts of the Central Argentine system, the bulk of the cereal traffic carried by the railway passes through this port, where there are elevators for storing, classifying, and loading the grain. 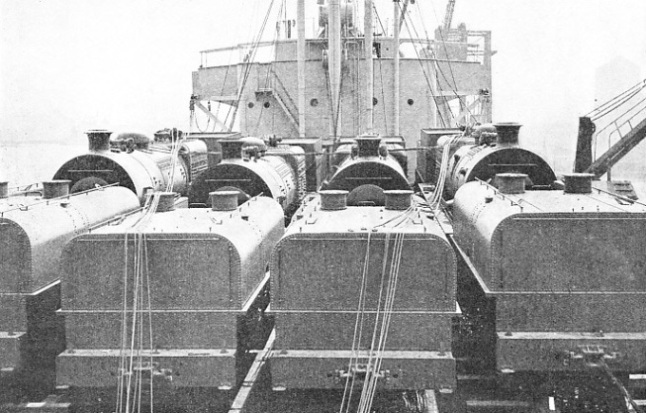 LOCOMOTIVES ON DECK. In 1929 ten “Beyer-Garratt” articulated engines were shipped from Birkenhead, Cheshire, to Rosario. This illustration shows four of the machines assembled on the ship and resting on wooden rails. The locomotives, built for the metre-gauge line, have cylinders 18 in by 26 in, driving wheels 4 ft diameter, boiler pressure 185 lb per sq in, and the total heating surface, including superheater, is 3,008 sq ft. The weight in working order amounts to 168 tons. The importance of Rosario as a port and railway centre is enhanced by the fact that it is the headquarters of the Central Argentine Carriage and Wagon Works, occupying about seventy-five acres. The Gorton Locomotive Works are situated at Perez, about ten miles from Rosario on the main line to Casilda. These works, completed in 1917, cover about seventy acres and embrace every phase of railway engineering. The main line from Rosario to Tucuman, opened in 1891, serves rich sugar plantations, to which this province owes its commercial importance; and a short branch from La Banda - a station on this line - connects with the city of Santiago del Estero, the capital of the province of the same name. Rio Cuarto, in the south-west of the system, is the centre of a district mainly devoted to the cultivation of wheat. Here, as also at Villa Maria on the main line from Rosario to Cordoba, the Central Argentine connects with the Buenos Aires and Pacific Railway. North Argentine (State) line, serving a number of picturesque holiday resorts in the higher hills, as well as to the provinces of Catamarca, Rioja, and San Juan. At Tucuman, another important connexion is effected with the State Rail-ways for the provinces of Salta and Jujuy and the international service to Bolivia and Peru. Of the 3,700 miles of line which compose the system 319 miles are double, two miles quadruple and the remainder single track. In general, the tracks are laid with 85-lb rails spiked direct to sleepers made of a hardwood known as red quebracho. Within recent years the 100-lb rail has been introduced on lines carrying heavier traffic, while in the Buenos Aires suburban section, where the life of the rails is appreciably shorter than elsewhere, chaired track construction has been adopted. This construction improves the running conditions, and permits a ready change of rail without disturbing other parts of the track. T he signalling conforms generally to British practice and varies in accordance with the type and volume of traffic on the different sections. On the Buenos Aires electrified suburban section are to be found power-operated installations, automatic signalling, and train describers and indicators. At many single-line stations the interlocking of the loops - which are five-eighths of a mile long - is concentrated in a lever frame in a readily accessible position near the centre of the platforms, and the points and distant signals are operated electrically. Practically all single-line sections are protected by the modern type of Webb and Thompson’s train staff instruments, and on double-line sections the block system is in use. AT BUENOS AIRES. This remarkable aerial view shows the termini of three big systems. The double-roofed station on the right is the Central Argentine Railway passenger station. The terminus in the centre belongs to the Cordoba Central Railway, while to the extreme left is the Buenos Aires and Pacific Railway passenger station. The huge Central Argentine terminus occupies an area of some 744,000 sq ft. It was opened in 1915, and is one of the largest stations south of the equator. The rolling stock consists of 675 locomotives, 1,227 coaches and 18,371 wagons. All the locomotives, goods and passenger types, are modern, thus enabling a uniformly high rate of speed to be maintained by the long-distance trains. The coaches, day and sleeping, are up to date in construction and equipment, and the dining-car service, from the standpoint of cuisine and attendance, is equal to the best on any European or North American railway. At present passenger traffic on the Railway is about 43,000,000 passengers a year, of which 37,000,000 correspond to the Buenos Aires suburban area. Goods traffic amounts to some 8,000,000 tons a year, and in the course of a year about a million head of cattle, horses, sheep and pigs are conveyed over the system. Among the principal items of goods traffic are maize, the volume of which fluctuates around 3,000,000 tons annually; wheat, 2,000,000 tons, and linseed, 500,000 tons. Flour, charcoal, wine, firewood, potatoes, petroleum, and general merchandise are other valuable sources of revenue to the company. The public traffic train mileage reaches 12,250,000 miles a year, of which 2,750,000 miles correspond to electric suburban trains, 5,750,000 miles to steam-hauled main-line passenger and mixed trains, and 3,750,000 miles to goods and livestock trains. The average gross load behind a goods engine is in the neighbourhood of 870 tons, although over certain sections the most powerful locomotives are capable of hauling over 2,000 tons, distributed between paying load and tare weight. The average load behind a passenger engine amounts to 284 tons, but the most important expresses hauled by P.S.11 type loco-motives frequently load up to fifteen coaches, representing a gross weight of 650 tons. The Central Argentine Railway operates the fastest train in South America. This is the daily express between Buenos Aires and Rosario and vice-versa known as the “Rapido”, which has been running since December, 1910. When first inaugurated this train had a schedule of four hours fifty-five minutes, which has gradually been accelerated to four hours for the run of 188 miles, an average speed of forty-seven miles an hour. This train is popular with business men in both cities, as it enables them to make the double journey comfortably in a day and allows them time in which to transact business. The train has Pullman and dining cars, and has established a reputation for punctuality. 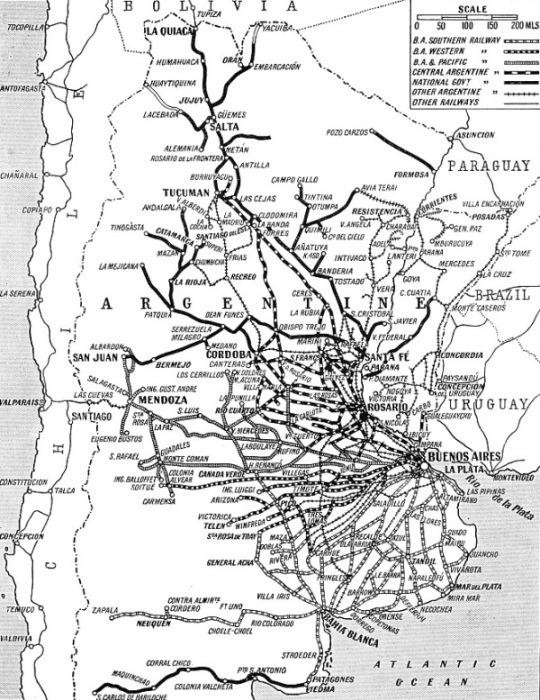 THE CHIEF ROUTES of the several railway systems in the Argentine Republic are indicated on this map. There are 23,704 miles of line open, of which 5,764 are controlled by the State. The first railway in the Argentine was opened to traffic in 1857. The normal gauge of the Argentine Railways is the Spanish one of 5 ft 6 in, but standard and narrow gauges are also to be found in this country. The Central Argentine was the first South American railway to electrify its suburban lines. 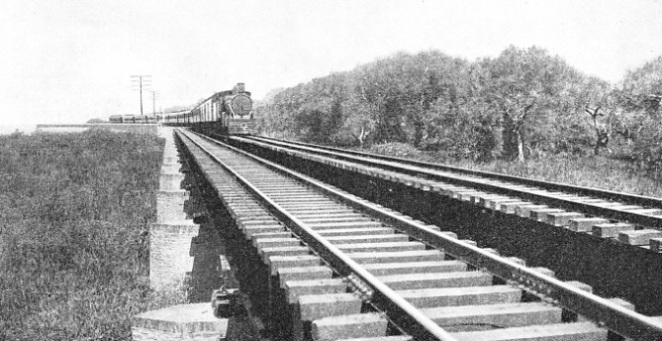 The first section, about eighteen miles long, has been electrically operated since August, 1916. The two remaining sections, comprising about twenty-seven miles, were completed and inaugurated in December, 1931. The total length of electrified track is about a hundred miles, constituting the most extensive broad-gauge electrified system in South America. The system is “multiple unit”, with third rail and direct current, 800 volts. Electrical energy at 20,000 volts is generated in the company’s central power station at Canal San Fernando, about sixteen miles from Buenos Aires, and is transmitted through underground cables to nine sub-stations. Electric power is supplied to the trains by means of a conductor rail laid alongside the track, the current being collected from this rail by means of contact shoes attached to the bogies of the coaches. The distance between Buenos Aires and Tigre, the terminus of the suburban line, some eighteen miles from the capital, is covered by a fast electric train in about half an hour. The suburbs served by the company are among the most attractive around Buenos Aires. The policy of electrification has added to the popularity of these places as residential centres and pleasure resorts, many of them having athletic clubs. The best-known suburb on the system is Tigre, on the River Lujan. Known as the “Argentine Henley”, this resort is the head-quarters of rowing clubs, and is the scene during the summer months of international regattas and events which attract spectators from Buenos Aires and other cities. Special trains are run for their convenience. Retiro, the Buenos Aires terminus of the Railway, was opened in August, 1915. It is the largest and finest terminal station south of the equator. The area occupied by the buildings and train sheds, including approaches, is about 744,000 sq ft, with a main frontage facing Calle Maipu of 850 ft, and a side frontage along Avenida Leandro N, Alem of 606 ft. 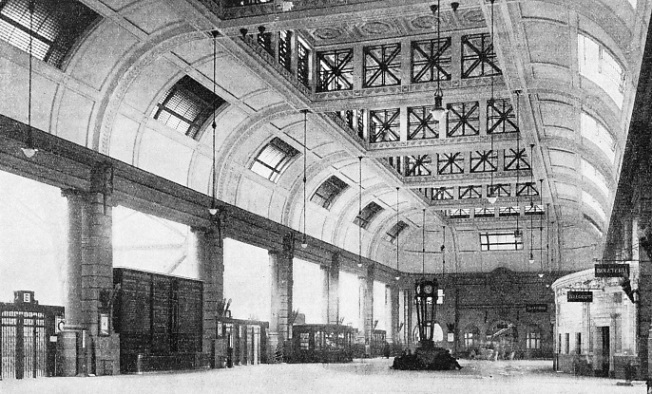 The booking hall is 200 ft in length, 60 ft wide, and 65 ft high. There are eight platforms, those for the main-line trains being 1,148 ft long and the others 820 ft long. The train shed is 787 ft long. There are two other handsome stations at Cordoba (opened in 1919) and Campana (opened in 1925). Campana Station is on the main line to Rosario and serves a small town and river port, near to which are large petroleum refineries. As far as Tucuman the Central Argentine Railway forms the first section of the northern transcontinental route known as La Diagonal de Hierro (“The Iron Diagonal”), which comprises six railway systems and runs from Buenos Aires through northern Argentina, Bolivia, and Peru to the Pacific port of Mollendo, and combines with the Antofagasta and Bolivia Railway for the Chilian port of Antofagasta. This transcontinental line offers an alternative and greatly shortened route to and from the United States via the Panama Canal and the West Indies, and, being free from interruption by snowstorms, is available all the year round. Consisting for the most part of a vast alluvial plain devoted mainly to pasturage and agriculture, the zone served by the railway lacks the spectacular grandeur to be found in other parts of South America, but two exceptions to this are the Cordoba hills and the province of Tucuman. 2,500 SLEEPERS A MILE are laid along the lines of the Cordoba Central Railway. The railway is metre-gauge, and Vignoles flat-bottomed rails are used exclusively, 70 lb per yard being the standard weight adopted. The rails are fastened with dog-spikes to hardwood sleepers. Above is a section of the permanent way with a Cordoba Express from Buenos Aires crossing a long viaduct. The Cordoba hills combine a delightful climate with some of the most picturesque scenery in the Argentine, and their popularity among holiday-makers and tourists is enhanced by the fact that they are as attractive in winter as in summer. The journey from Buenos Aires (431 miles) is accomplished overnight by express trains equipped with dining and sleeping cars. The principal beauty spots are Alta Gracia (connected with the city of Cordoba by a branch line); La Falda, La Cumbre, Los Cocos, San Esteban, Capilla del Monte, and Cruz del Eje (all on the State Railway); and Mina Clavero (connected with Cordoba by an omnibus service). At all these places there are good hotels with facilities for lawn tennis, swimming, riding, driving, and motoring. There are golf courses at Alta Gracia, La Cumbre, La Falda, Ascochinga, and Villa Allende. Tucuman is one of the most important points on the railway. It is the headquarters of the national sugar-cane industry and a fruit and vegetable-growing centre. The products of this area contribute materially to the railway receipts. Its genial climate, picturesque scenery and sub-tropical vegetation attract visitors tor winter holidays. From the beginning of May until the end of October, accommodation on the sleeping and dining-car expresses leaving Buenos Aires for the 700 miles journey to Tucuman is heavily taxed by passengers bound for that resort and for places farther north, such as the spa of Rosario de la Frontera. THE RETIRO TERMINUS of the Central Argentine Railway at Buenos Aires has eight platforms, those for the main line being 1,148 ft long, and the others 820 ft in length. The booking hall is 200 ft in length, 60 ft wide and 65 ft in height. The Central Argentine Railway in the suburban area round Buenos Aires carries some 37 million passengers annually. In the province of Santiago del Estero the railway traverses a zone naturally arid and unproductive. But by a means of dry farming, introduced by the company in 1913 and adapted to the nature of the soil and local climatic conditions, abundant crops, fruit and vegetables of many species and excellent quality, as well as cotton, are successfully cultivated. Practical instruction, and educative propaganda by similar methods carried on among the farming community have given an impetus to agriculture and fruit-growing in this region, and railway receipts have benefited. Because of its climate and its proximity to the hot medicinal springs of Rio Hondo, Santiago del Estero is coming to the fore as another winter holiday resort. Active propaganda, cheap tares, and excursion trains have popularized the holiday resorts, and the railway has stimulated passenger traffic from the provinces to the capital by the same methods. The Buenos Aires and Pacific Railway was founded in London in 1882 to acquire from John E. Clark part of a contract he had made with the Argentine Government in 1874 for the construction of two rail ways. One of these was to run between Buenos Aires and San Juan, passing through Rojas or Junin, Villa Mercedes, San Luis, La Paz, and Mendoza. The other was to run from Mendoza or San Juan, in the direction of San Felipe de los Andes (Chile) up to the limit of the Argentine Republic, either by the Los Patos Pass, or by the Uspallata Pass. The original contract was for a metre-gauge line, but this was altered to the present broad gauge of 5 ft 6-in. Construction began in 1882. The part acquired by the Pacific Railway was between Mercedes in the province of Buenos Aires, about seventy miles west of the capital, and Villa Mercedes in the province of San Luis. The company later obtained a concession to extend the line to Buenos Aires. The first section of sixty miles between Mercedes and Chacabuco was opened in March, 1885; the second, from Chacabuco to Diego de Alvear (then called Orellanos), ninety seven miles, was opened in February. 1886; and the remainder, from Diego de Alvear to Villa Mercedes, 201 miles, in October, 1886. The first passenger train made the journey from Mercedes to Villa Mercedes, 359 miles, on October 15, 1886 It was about 165 ft. long, and had neither restaurant nor sleeping cars; trains are now as long as 1,300 ft. The return journey was made with the same engine and crew, the driver being Mr Alfred Marsh, and the fireman Mr. Patrick Wynne. Mr. Wynne became superintendent of the traction department of the Railway, and retired in 1928. The section of the line eastward from Mercedes to Palermo, in the city of Buenos Aires, was opened in 1888, and at that time the company used the tracks of the Central Argentine inwards from Palermo to the heart of the city, the Central station of the Central Argentine then being near the Government House. 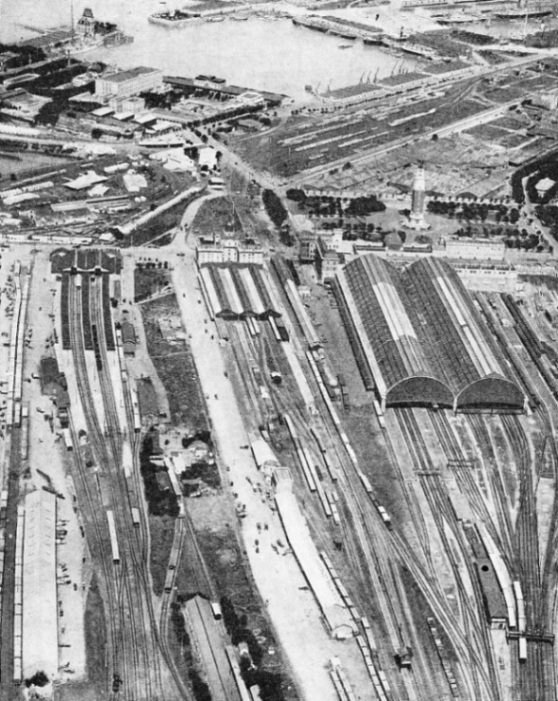 It was not until July, 1912, that the Pacific was able to run its trains into the present terminus at Retiro, close to the docks and alongside the port works. The early history of the railway was chequered. Construction from the two extremities, Mercedes and Villa Mercedes, instead of from Buenos Aires, meant that materials had to be carried over the Western Railway to Mercedes, or from Rosario, via the Andine Railway, to Villa Mercedes. The Western Railway could not cope with its own traffic and the Andine Railway refused to carry the materials. But when Mr. Clark hired bullock carts for the transport to railhead, the Andine Railway, which had regarded the Pacific as a future competitor, realized that resistance was useless, and allowed the materials to go over its line. THE CORDOBA-BUENOS AIRES EXPRESS at speed. The distance between the two cities is 431 miles, and the best expresses cover the Cordoba-Buenos Aires journey in twelve hours. The night trains on this route are equipped with modern sleeping and dining cars. In 1886-7 an outbreak of cholera paralyzed all business in the western provinces. In 1889 exceptional floods stopped traffic on the main line between Castellanos and Mackenna for some nine months. Floods extended for 112 miles, and twelve miles of track were submerged in as much as three feet of water, while for forty-seven miles the water was either level with the top of the rails, or the earthworks were so sodden that it was impossible to run trains. The Picasa lake, on the main line 235 miles west of Buenos Aires, also gave trouble. The loss of revenue due to the stoppage of traffic and the cost of repairs left the railway in a financial plight, but it recovered. In 1900 it agreed to work the Villa Maria and Rufino Railway, which runs north from Rufino on the Pacific line for a distance of 141 miles. Sanction was obtained from the Government to build a permanent river wall and reclaim land to enable the Pacific and also the Cordoba Central Railway to enter the city on their own lines and gain access to Retiro, alongside the track of the Central Railway. Land reclaimed from the river was first filled in with semi-liquid mud dredged from a canal, and afterwards consolidated with earth from a ballast pit. Retiro, where the terminal stations of the three railways are now situated, was the name of a district the centre of which was a slave market in Spanish colonial days. An area of about 300 acres was acquired outside the city boundary, between Deveto and Caseros, for erecting running sheds, workshops, and sorting sidings. In 1907 the section from Junin to Villa Mercedes, 270 miles, was relaid with 100-lb rails to replace 50-lb rails, enabling what were then the most powerful locomotives in South America to be employed. These locomotives were of 132½ tons weight, and were capable of hauling 2,700 tons. New branches were built and other lines were bought. 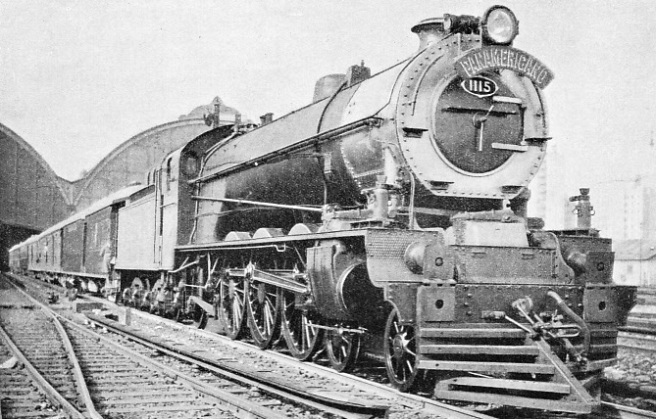 2-8-2 locomotive was built by Beyer Peacock and Co, and was put into regular service in 1929. A passenger engine used on the Buenos Aires and Pacific Railway. This 4-6-4 tank engine weighs 100½ tons in working order. It has a fuel capacity of 3,100 gallons of water and 5 tons of coal. The locomotive was built by R. Stephenson and Company and put into regular service in 1930. The Buenos Aires and Pacific Railway has some 600 engines in operation on its lines. 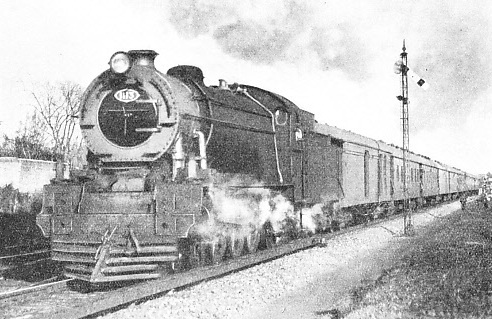 4-8-4 tank engine in operation on the Central Argentine Railway, for hauling passenger and heavy goods trains. The Central Argentine Railway possesses some 670 modern locomotives, and the average load on this system behind a freight engine is about 870 tons. The corresponding figure for a passenger train is about 280 tons. The terminus and goods yard at Retiro occupy no acres, and the high-level line giving access from Palermo is the most important engineering work carried out by the railway. This line is five miles long; it runs through Palermo Park on an embankment, and consists of two viaducts of brickwork containing 116 arches of 42 ft span each, and nineteen steel bridges, the longest of which is 179 ft.
From Palermo the line traverses a densely populated area to the city boundaries, ten miles from Retiro Station. The local section extends to Jose C. Paz (named after the founder of the newspaper La Prensa), twenty -five miles from Retiro, with twelve intermediate stations. Among the suburbs outside the city boundary are Caseros, which has a working class population, Bella Vista, El Palomar, near the military college and aviation station, and Hurlingham, favoured by British residents. Hurlingham has a club of that name with a golf-course, polo, cricket and football grounds, swimming pool, and other facilities for sport. One of the longest stretches of dead straight and dead level track in the world extends for 205½ miles from west of Junin to west of Mackenna. Although most of the country traversed by the railway is flat, hilly country is encountered beyond Villa Mercedes in the direction of San Luis and Mendoza, to the north-west from Mackenna to Sampacho, and on the main line through Beazley. During its passage westward across Argentina the Pacific runs through different zones. For the first hundred miles out of Buenos Aires the tine passes through pasture lands devoted to dairy farming, market gardening, and hay production. Farther west, large tracts are under cereals, maize predominating in the eastern and more humid zone, and wheat in the central districts. Along the whole route a large part of the country is devoted to cattle. After Justo Daract, 407 miles from Buenos Aires, scrub predominates for 170 miles; but cereals have been grown successfully as far west as San Luis. At La Paz the appearance of the country changes, for here the line reaches the beginning of the irrigated zone of the province of Mendoza. THE GRAND HALL of the Retiro Terminus of the Central Argentine Railway at Buenos Aires. This Grand Hall or concourse is 480 ft in length 82 ft in width, and 63 ft in height. Of lofty and spacious design the station buildings at Retiro rank among the best in the world. There are few large towns on the Pacific Railway. Mendoza, with a population of 78,000, is the largest city on the line after Buenos Aires, Junin, 33,000, where the railway workshops are situated, being next. The most distant termini are Albardon (785 miles), Marquesado (763 miles), San Juan (757 miles), and Eugenio Bustos (729 miles). During the construction of the line there were many adventures. The survey party found the Tunuyan River in flood and over a thousand yards wide; the water was waist-high and flowed over a sandy bed. To make a temporary ford the carting contractor sent men wading across until they tired, thus shifting as much sand as possible and marking out a line. The next day the men rode horses to and fro making the bed firmer. This was repeated on the third day, until six carts were driven across in the afternoon at the best pace possible, and if a cart stopped for a second the sand was scoured from under the wheels. During the building of the Las Catitas-San Rafael branch an engine fell through what had been a temporary bridge into a deep hole of water and sand caused by a washaway, and four men had to swim out. All that could be seen of the engine after a few minutes was the funnel, sticking out of apparently solid ground, the sand having been carried into the ground by the sinking of the flood water. On the same line a hailstorm washed away the earthworks of a sandhill section and delayed the work. As there are few large towns and holiday resorts on the system the passenger traffic is not heavy. Passenger trains run daily between Buenos Aires and Alberdi (209 miles), Rufino (262 miles), Villa Mercedes (429 miles), Mendoza (661 miles), and San Juan (757 miles). Passenger and mixed trains combine at junctions with the main line trains and serve the outlying districts. Restaurants and sleeping cars are provided on long-distance trains. The international train between Buenos Aires and Mendoza takes twenty hours for the journey. Wine is the most important item of traffic, and is carried either in special wagons of 40 tons capacity or in oak casks. The cereals and maize traffic is heavy, the fine cereals including wheat, linseed, oats, barley, rye, and birdseed. Cattle trains carrying 500 beasts are common; fruit is carried in refrigerator wagons. 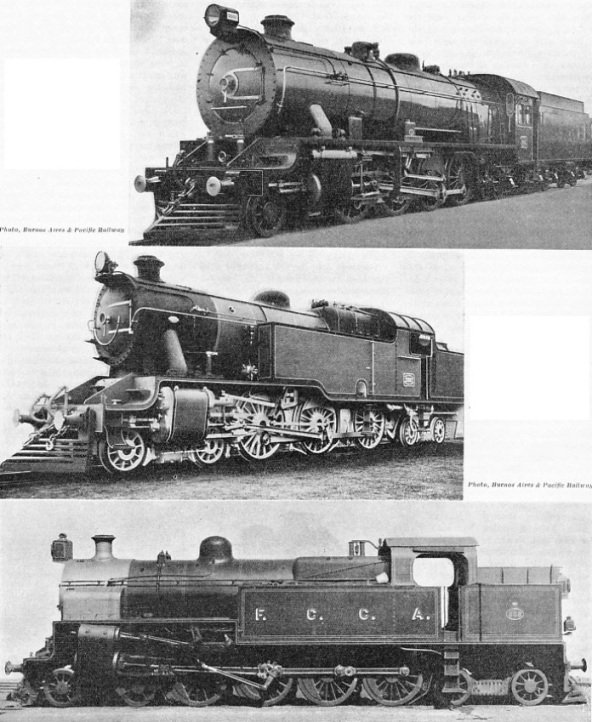 There are over 600 locomotives, the most powerful passenger engine being of the 4-6-2 wheel arrangement with a tractive effort of 26,472 lb at 85 per cent of the boiler pressure, and driving wheels of 5 ft 11-in diameter. Engine and tender weight in working order is 161 tons. The “Garratt” goods engine is a 4-8-2 + 2-8-4 type, with tractive effort of 41,525 lb at 70 per cent of boiler pressure, and 5 ft diameter driving wheels. This articulated type weighs 197 tons in working order. The “Mikado” type 2-8-2 has a tractive effort of 37,627 lb at 70 per cent of the boiler pressure, and 5 ft 7-in diameter driving wheels. Weight in working order is over 200 tons. At one time this was said to be the largest non-articulated locomotive built in Europe. A number of engines are fitted for oil fuel. The route mileage is 2,806. The maximum gradient on the main line is 1 in 78, and on branch lines 1 in 50. The principal rails in use are 70 lb, 72·8 lb, 85 lb and 100 lb. Busy sections are laid with 100-lb rails, while 70-lb rails are used chiefly on branch lines and station sidings. The Cordoba Central Railway has a route mileage of 1,218 of metre-gauge lines. The original line was built in 1887, and extended from the city of Cordoba in a south-easterly direction to San Francisco. The company represents an amalgamation of various lines. The main station is the Retiro Station at Buenos Aires, the stores are at Alberdi, near Rosario, and the workshops are at Alta Cordoba. The main line runs from Buenos Aires to Rosario, Cordoba and Tucuman. Vignoles flat-bottomed rails are used for the track, 70 lb being the standard. The rails are fastened with dog-spikes to hardwood (quebracho Colorado) sleepers, which number approximately 2,500 per mile. Though the line was laid on earth ballast, stone ballasting has been since carried out. From Retiro to Boulogne, thirteen miles, the main line has been doubled. The terminal goods yard has been built on land reclaimed from the river to the north of Retiro Station, and is called the Re tiro Norte yard; it has access to the port. The principal stations are at Retiro, Rosario, Cordoba, Santiago del Estero, and Tucuman. As there is no city in the Argentine comparable with Buenos Aires for size and importance, the traffic on all the railways is more or less in one direction for goods, and on the Cordoba Railway the south-bound goods consist of cereals, sugar, charcoal, and other produce. For the year ended June 30, 1934, goods traffic exceeded 2,029,000 tons. ENGINE SHEDS of the Cordoba Central Railway at Alta Cordoba. Here the Company also has its workshops, where locomotives and rolling stock are kept in repair. The works cover an area of over 123 acres. You can read more on “British Enterprise in South America”, “Main Lines of Brazil” and “The Trains of Uruguay” on this website.